This post was written by Dillon Blankenship, one of our current Hubbard Fellows. All photos are by Dillon. Back in September I had an interesting experience while sweeping out the shop. With a dustpan full of grass and dirt, I stepped out to the driveway and spotted a black and orange beetle scurrying across the rocks. As an insect fanatic working in the Plains, my first thought was “ABB! AMERICAN BURYING BEETLE! Nicrophorus americanus!” – the endangered carrion beetle I had been hoping to come across for the last half-decade or so. Elated, I carefully directed it into a jar for closer inspection and called Chris to see if we had ever recorded ABB at our sites on the Platte. He informed me we had not, so I took the jar and ran to my house to get an insect identification guide. On the other side of the phone, Chris opened his computer and we began teasing out the distinguishing characteristics of the American burying beetle from the other fifteen or so carrion beetle species in Nebraska. 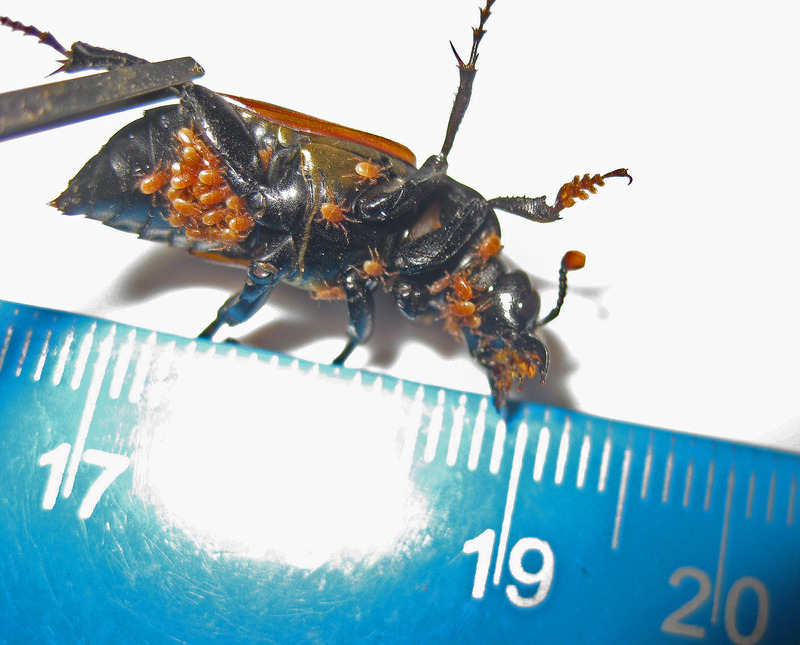 The burying beetle Dillon found… The Nature Conservancy’s Platte River Prairies, Nebraska. We started with the orange bands on its back (did they go all the way across or did they stop at the midpoint of the wings?). Were the bands zigzagged or straight? How big was it? What did the antenna look like it? How about the pronotum – okay, we probably called it “the plate behind its head” – was it red or black? The final question was the best indicator. The pronotum – the top side of the first segment from the head (the prothorax) with the first pair of legs – of the beetle I had found was entirely black. 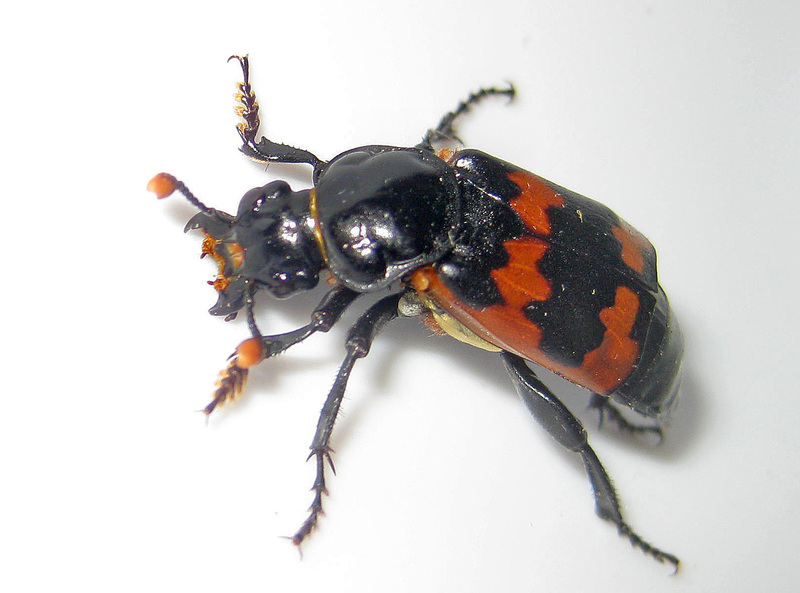 The American burying beetle’s pronotum is reddish-orange. The creature I found was not an American burying beetle, but it was still interesting. First of all, carrion beetles (also called burying beetles) are a family of beetles (silphidae) that are characterized by their feeding, mating, and rearing of young in the carcasses of dead animals. There are at least forty-six species in North America. They seem to have a keen sense of smell so they can track down a recently deceased critter – like a mouse or a bird – and claim it as their own. Males and females find each other at the site and the most dominant mating pair battles off other individuals as they bury their prize. Flies are perhaps the greatest competition for the corpse, as they will lay eggs that become maggots and cause some beetle species to abandon the resource. Some silphid species just eat the maggots too. Beetle eggs are laid and, after hatching, feed on the carrion up to pupation and into adulthood where they will disperse and continue the cycle of reproduction. Some carrion beetles exhibit a high level of parental care, staying with their young to protect and feed them – an uncommon trait in the insect world. The underside of the beetle was covered in tiny mites. It turns out they are not harming the beetle at all, but just hitching a ride to their food source. As I examined the specimen I had discovered, I was horrified by the large number of little mites crawling around on it. The mites congregated on its underside and I imagined they were an uncomfortable burden. HOWEVER, I read that these types of mites are found on almost all burying beetles. They are phoretic, meaning they travel with and do not necessarily harm the beetle itself. Bumblebees are also commonly found with little mites hitching rides. The beetle mites are said to be in the genus Poecilochirus and are mutualistic (beneficial, not parasitic) with the burying beetles insofar as they “hop off” the beetle and onto the carrion to feast on the fly eggs and larvae that would otherwise compete with the beetles’ brood. Teamwork! Perhaps the most relevant part of this for humans is that the burying beetles help keep our prairies clean! As part of the biotic decomposition network of fungi, bacteria, flies and other beetles, they return the nutrients of dead organisms back to the soil. Thank you, burying beetles. Though I didn’t find an American burying beetle, I DID find a close relative. I am calling it a margined burying beetle (Nicrophorus marginatus) until somebody more taxonomically inclined corrects me. It was a great adventure trying to figure out who my beetle was and it seemed no worse for the journey when I returned it to the prairie. 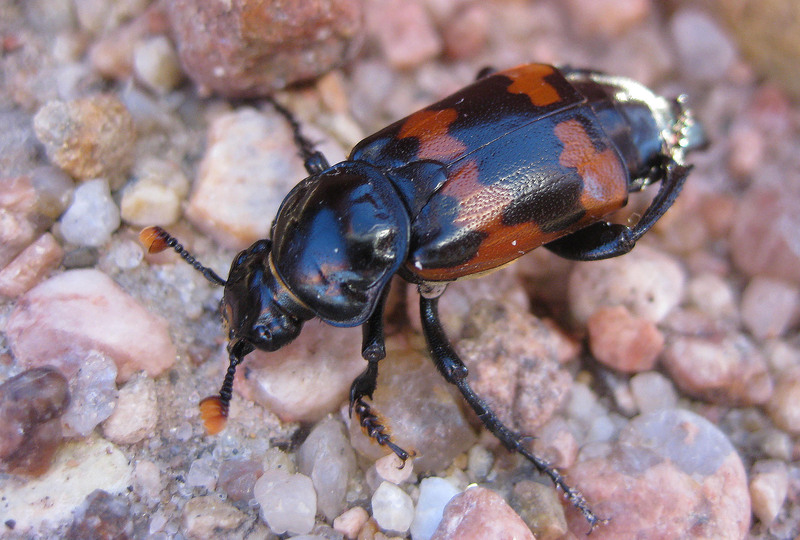 This entry was posted in Hubbard Fellowship, Prairie Insects, Prairie Natural History, Prairie Photography and tagged american burying beetle, burying beetle, grassland, insect, nebraska, Nicrophorous marginatus, Nicrophorus americanus, platte river, prairie, silphidae by Chris Helzer. Bookmark the permalink. Love all the Nicrophorus! Great article. What a neat photo, with all the mites! Thanks for sharing and educating. Love your description of your research process – terrific! I found a somewhat similar species working on a mouse on a morning run a few years ago here in east central Illinois ( 40.22 °N, 88.36 °W ). Will try to dig up its photo & information. It was along the roadside among the corn and soybean fields. Sounds interesting, Paul. I read that burying beetles are temperate specialists – too much competition in the tropics, I guess, though there are a few species there too. Good to hear that they might do all right in row crops. Fantastic creatures! I found a burying beetle in October while leading a group of students on a hike in East Central Illinois as well. The ‘plate behind the head’ was yellow and it had mites hitching a ride as well. Having never seen this insect before, it was great fun looking it up in a field guide when the students and I returned to the classroom. Sharing the information learned, as well as a short youtube video of the insect working together to ‘bury’ their latest carcass, was hopefully a moment the students will remember from their field exploration! Lara, my first experience with silphid beetles was also on a hike leading students! Was your beetle, perchance, Necrophila americana? That is one I know with a yellowish pronotum. My discovered beetle has the same orange markings as yours in this post but the pronotum was dirty yellow with two black spots. I believe it was the Gold-necked carrion beetle, Nicrophorus tomentosus. Nice article. One accepted common name for N. marginatus is the “Margined Burying Beetle.” Thanks for taking the reader through the identification process. This is something that a lot of folks don’t take the time to do, but is so educational. Hey, Bob! MARGINED burying beetle! Yes, that sounds much better. Perhaps we can get Chris to update it in the post. Thanks! Amazing pictures Dillon! Insect behavior is fascinating. I also think it’s really helpful to identify the key field markings for people new to bug ID. Great post. What a beautiful little beetle! Thank you for not killing it, putting a pin through it’s body, and sticking it on a board. I much perfer to see the critters moving about. Thanks. Great post on a well-done ongoing blog. I found this exact beetle on July 28, 2015. I got a blurry photo at a site in Southern Colorado. I live in Jerome Idaho and I just found a burying beetle under a rock. How cool is this to find a critical endangered species in my yard?